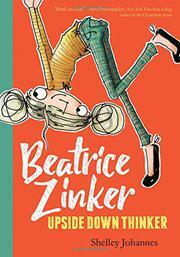 Beatrice Zinker is a kinder, gentler Judy Moody. Beatrice doesn’t want to be fit in a box. Her first word was “WOW,” not “Mom.” She does her best thinking upside down and prefers to dress like a ninja. Like Judy Moody, she has patient parents and a somewhat annoying younger brother. (She also has a perfectly ordinary older sister.) Beatrice spends all summer planning a top-secret spy operation complete with secret codes and a secret language (pig Latin). But on the first day of third grade, her best friend, Lenny (short for Eleanor), shows up in a dress, with a new friend who wants to play veterinarian at recess. Beatrice, essentially a kind if somewhat quirky kid, struggles to see the upside of the situation and ends up with two friends instead of one. Line drawings on almost every spread add to the humor and make the book accessible to readers who might otherwise balk at its 160 pages. Thankfully, the rhymes in the text do not continue past the first chapter. Children will enjoy the frequent puns and Beatrice’s preference for climbing trees and hanging upside down. The story drifts dangerously close to pedantry when Beatrice asks for advice from a grandmotherly neighbor but is saved by likable characters and upside-down cake. Beatrice seems to be white; Lenny’s surname, Santos, suggests that she may be Latina; their school is a diverse one.